If rooting around murky attics for lost treasure is your thing, then this next game is going to be right up your street. 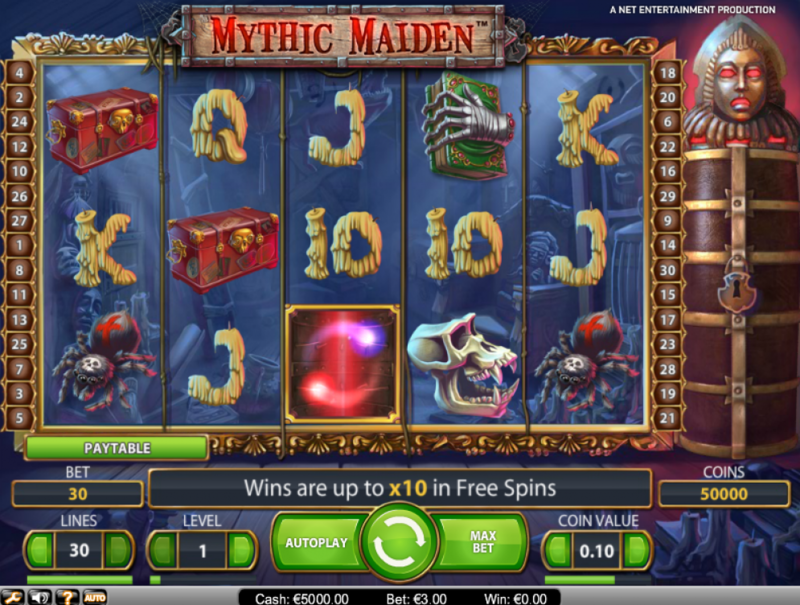 This NetEnt eerie offering is called Mythic Maiden and with spooky symbols and a ghostly soundtrack it’s certainly different from other slots. Based loosely around what one would assume is meant to be some kind of horror story theme, we hope you feel brave enough to give it a try. 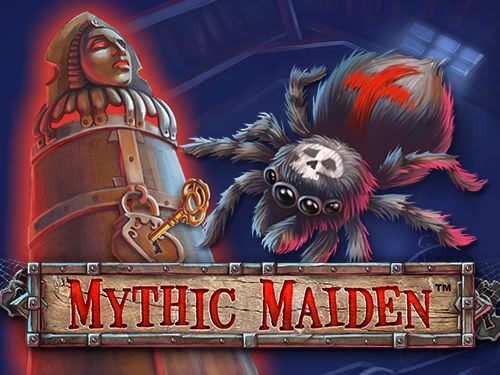 Mythic Maiden is a 5-reel, 30 pay line slot with a spooktacular RTP of 96.6% for all you treasure hunters. The reels spin against a dusty attic back drop, which is transparent so you get to see what’s creeping up behind them. All the lower value symbols have been drawn to look like melting candles and the higher value symbols are equally spooky. Things such as skulls, spiders, spell books, shrunken heads and chests, things you would normally avoid at all costs in a dark attic! Bet Amounts – Betting begins at just 30p per spin and can be gradually increased to £30 per spin, which is still affordable for most balances. Adjust your bet by changing the coin level to the left of the screen or the coin value to the right of the screen. Wild Symbol – In Mythic Maiden your wild is the full moon that transforms into a skull. It will substitute for all other symbols except the scatter. Scatter Symbol – Swirling circles form your scatter symbol, or are they ghosts? Landing three or more anywhere in view will trigger the bonus spins feature. Wild Multiplier Feature – Not only does your wild symbol do a great job of being spooky, it also doubles as a multiplier too. Any win that has a wild as part of the combination will be awarded a x3 multiplier to it, that should help ease those jitters. Bonus Spins Feature – Once you have landed yourself three or more of those swirly ghost scatters, you will be allocated your spins. When the spins begin you will notice the creepy iron maiden at the side of the reels will open up and more swirly ghosts are inside. After every spin within the bonus round the iron maiden will award a multiplier and spins. Multipliers can range from x2, x4, x6 and x10, and spins will be awarded at random up to x2. The bonus round can be retriggered from within by landing 3 or more swirly scatter symbols. Meaning the round can go on for some time if you are lucky enough to re trigger, or to get extra spins allocated from the iron maiden! Mythic Maiden is the perfect game for those of you that despise the bright cheery graphics that most slots are made up of these days! Not just that, the bonus feature and the wild multiplier mean that wins come fast and can often be on the bigger side. Halloween may only happen once a year but with this game you get a slice of it whenever you want.